CitizenTube: What's news on YouTube? It's all Michael Jackson, all the time. What's news on YouTube? It's all Michael Jackson, all the time. 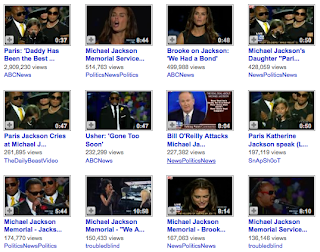 A look at the "most-viewed" section of YouTube's News and Politics page... the last time the page was this dominated by one story was during the 2008 political conventions, when everyone was logging in to watch speeches they'd missed.